We had an eventful end-of-July and it seems like August is just whizzing by! I feel like this summer went by way too fast :(. But we’re trying to make the best of our time together (Jorge and I alone, and our weeks with the kids :)). 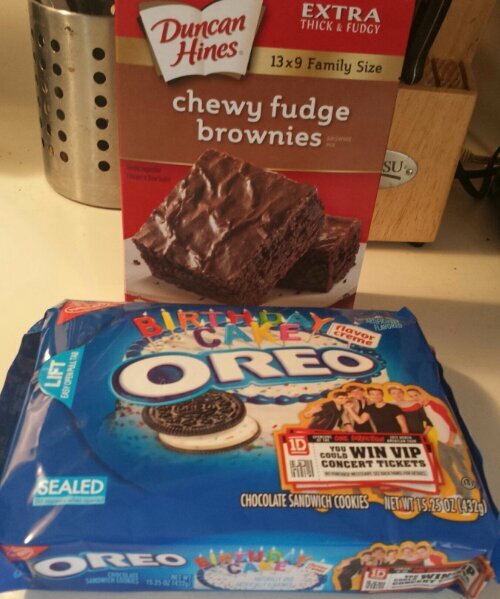 1 box Duncan Hines chewy fudge brownies (make sure it’s the 13×9 family size box). Prepare the brownie batter as stated on the box. Set aside and preheat your oven. Spray Pam on a 13×9 pan (I used a glass one). Spread half the batter in the pan, set aside the rest. 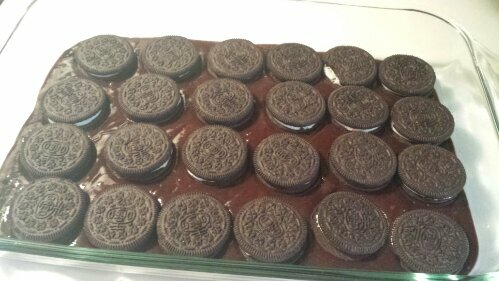 Begin carefully making an Oreo layer until you fill the pan. Carefully pour the remaining batter over your Oreo layer. 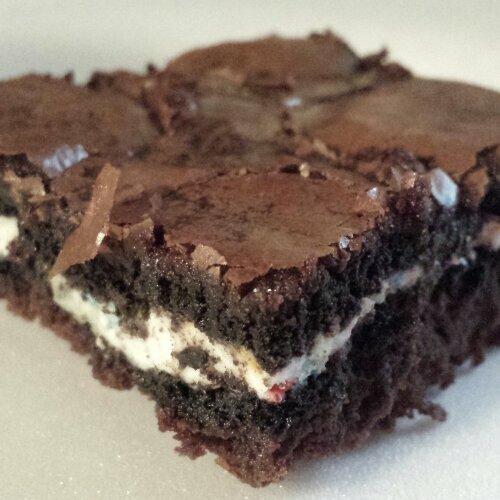 You may need to spread some with a spoon to completely cover the Oreos. 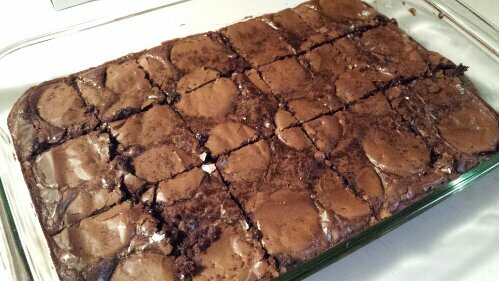 Bake your brownies according to the 13×9 time on the box (I’m typing this weeks later so I forget what the time is!). Once they’re out, let them cool just a bit. 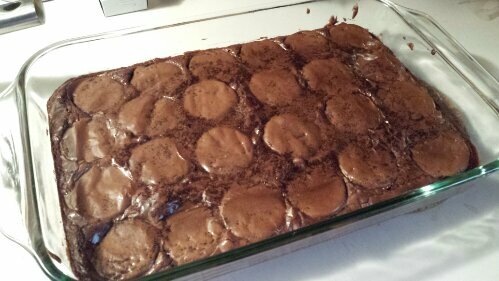 Once cool-ish, cut your brownies into squares. I was thrilled that the butter knife just slid through! Use a spatula to serve your brownies and enjoy :). When the kiddos are at their other parents’ homes Jorge and I will do something around the house (like paint the doors and trim in the kitchen, or clean), or watch movies. We STILL haven’t re-started with the jogging, but we’re still doing the low-carb thing (when we’re not baking with the kids, heh), so we’re maintaining, thank goodness. Sally and I hadn’t gotten together, or talked really, in almost 2 months, so we caught up last week (having lunch at Feldman’s and then I went over after work one day) and we’ve been texting back and forth. I need to remember to make time for my friends. I get so busy with everyday life that I neglect them sometimes :(. We were fortunate enough to celebrate Eenan’s 14th birthday at South Padre Island last weekend. It was hectic, getting things ready literally that morning, and the commute was insanely long! Well, not really, we actually made it to Port Isabel in 45 minutes…but we were in line from Port Isabel to the bridge for about an hour. It was like Spring Break, not even joking. We got to the hotel, checked in, then unloaded all our luggage and the kids and Mom. A lot of crap gets packed for 3 adults and 6 kids!! The room was booked for Jorge for us, so when we got to the hotel and realized it wasn’t exactly like the photo they showed us, we were a little disappointed. But we couldn’t complain. We got hooked up. We got everyone settled and went to pick up dinner. The streets were INSANE. People everywhere, traffic. It was seriously like some kind of holiday. We ended up at Daddy’s, which was packed, went straight to the bar and ordered our seafood platters. My love and I chit-chatted while we waited, then headed back to the hotel to eat with the family. The kids loved the food. Mmm…I’m craving some now!! Jorgie didn’t have trunks, so we went to the nearest store and bought him some and picked up a few things at the only supermaket on the island. We put the kids to sleep around 10pm (Emily crashed out at 8pm! ), then my love and I sat in the balcony and just talked about everything. About us, our kids, our plans for the future, everything. We don’t always have time to sit and just TALK, so it was nice :). We went to bed and at around 3am Emily woke me up. “Mama,” she whispers and tugs at my arm sleeve. “What happened, Baby?” I croak. I open one eye and see two huge eyes staring back. “I can’t sleep anymore! !” she whispers back. I snuggle her and we both fall asleep again. We get up and wash up for breakfast the next morning. After we all ate, we went back to the room and the kids watched TV for a good hour or so while Jorge napped (or tried to, heh). We showered, got our stuff together, checked out and headed to the beach. We parked, sunscreened everyone up and then it was play time. The kids had a blast :). We couldn’t find a place to have lunch, so after we washed up (took me FOREVER because the older lady that was in front of my literally washed every fold and crevice she had. Twice -_-), we headed to Burger King. We ate, drove home, and picked up an Oreo ice cream cake from Dairy Queen (Eenan’s request). We picked Eenan’s gift up (The Last of Us) and then they all got ready to leave for the week :(. I love those kiddos! We had such a great weekend. Too bad it couldn’t have lasted longer!! Ok. Just wanted to get this posted before more time passed. I’ve got an UNO game to join! Omigod your boys are so big! (Actually so are your girls!) Where does the time go? 14 already?!? Mmmm those brownies look like they are to die for!